Posts tagged "Ethan Phillips (Voyager)"
Superhero Cinema’s quest to show the best, the brightest, and yes even the "cheesiest" examples of Superheroes in Movies and TV continues. We’re going to have some fun this year, with a great mix of the old and new and a special midnight show of Dr. Horrible’s Sing-a-Long Blog. 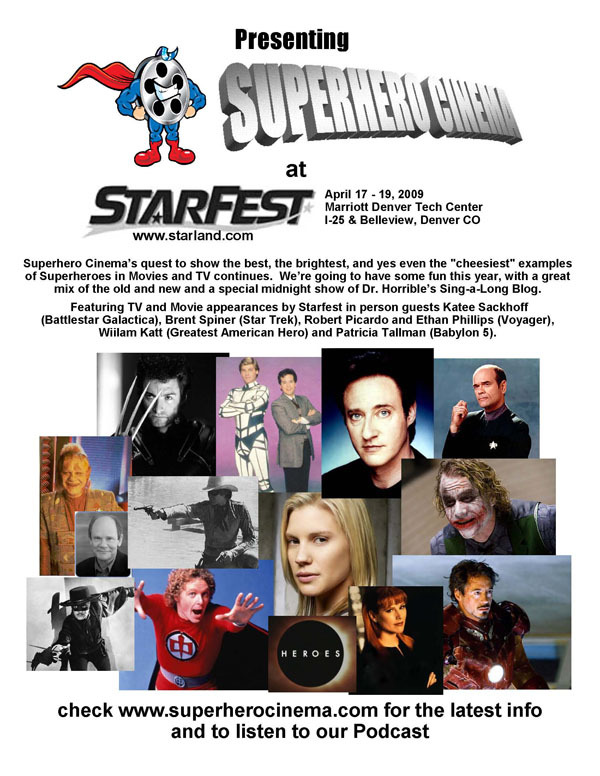 Featuring TV and Movie appearances by Starfest in person guests Katee Sackhoff (Battlestar Galactica), Brent Spiner (Star Trek), Robert Picardo and Ethan Phillips (Voyager), Wiilam Katt (Greatest American Hero) and Patricia Tallman (Babylon 5).